Between 1908-1940 more than 75,000 sears homes were built. 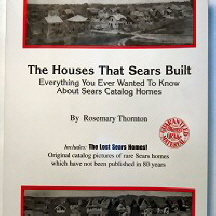 Sears kit homes contained 30,000 pieces and a 75-page instruction manual. Prices for this build-it-yourself kit house ranged from $600-$6000. This book contains catalog pictures of rare Sears homes, as well as Techniques for finding Sears homes in your city.